Do you work for Adobe Connect? "It's a lot of fun and it's interactive, and it feels much more personal"
What I like most is that Adobe Connect offers features such as email integration and conference rooms that users can customize. The application also includes visualization tools such as probes, chat, blackboards and a console to mix video sequences to increase the participation of the participants. What I do not like is the problem I have with the platform is that the long videos during the meetings never work, and it has forced us all to exclude the videos from our presentations. I recommend Adobe connect because it has flexibility in working sessions, whiteboards, videoconferences, etc. Most of our sessions are simple PowerPoints that are loaded in the room, use integrated telephony and chat for communication. But the system is robust, and offers almost anything you can imagine doing in an online meeting. 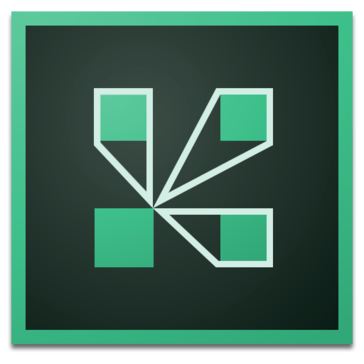 We record most of our sessions, and Adobe offers good tools to edit the recordings, which can then be shared directly from the Adobe platform. The pods available in the room allow you to share documents during the meeting, play audio and video files, polls and surveys, and of course share screens. The new HTML client means that participants no longer have to leave the browser to participate in meetings, and there is a mobile client to join meetings through Android or iOS. 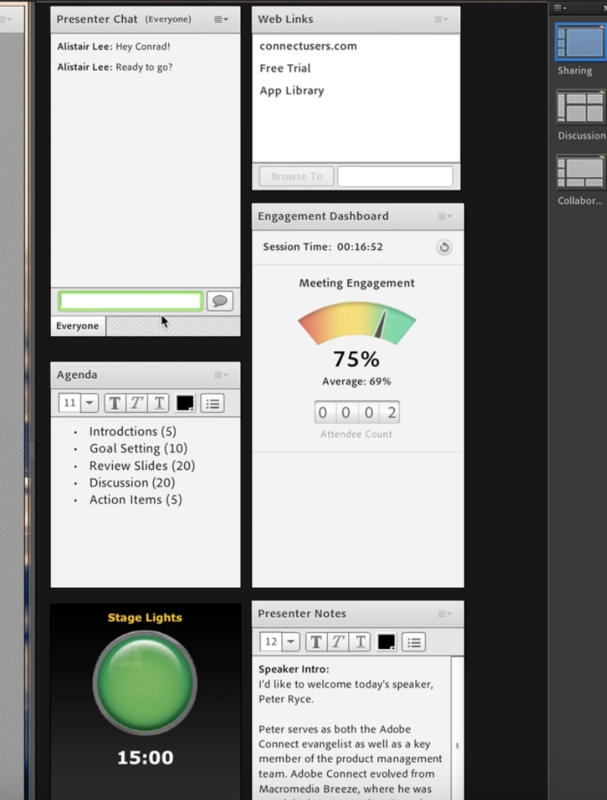 The management interface offers branding so you can ensure that all meetings have the logo and colors of your company. In general, it's a pretty elegant package. We use Adobe Connect in the company because it is a web conferencing software solution used by companies to conduct online meetings, webinars and training sessions. The solution is for ad hoc collaboration, and so we can have planned online meetings. The solution allows online audio and video collaboration on all devices (including mobile platforms). The participants that use desks can join meetings without installing any software for these characteristics, it has not helped much in the company and in turn we solved the connection problems that we had previously. "I use it a lot for videoconferences and E-learning"
In our company it is very important to have different types of tools that allow us to communicate effectively while we can learn new practical methods that allow us to enhance our job skills. Adobe Connect is an extraordinary tool that enables this. Thanks to its state-of-the-art technology, Adobe Connect brings us closer as workers, since we can make videoconferences with the best levels of security, maintaining high levels of quality in video and audio; these characteristics we use daily in our work to make meetings in video conference rooms where, generally, I am the one who has the privileges of administrator, and I invite our staff to the videoconference rooms to discuss issues associated with our interests as Health Management. Currently I have been liaising with different companies to request services in the area of equipment management and hospital administration, and thanks to this we have been adopting E-Learning with Adobe Connect, and we are very good at it, employees feel comfortable using this software to acquire knowledge. The limitations I found of this software were mainly when I learned to use it because it has certain functions that require a minimum of computer knowledge, as is the function of administrator, however, after learning to use this, I have made it very easy to use this software, therefore, I do not think it is necessary to expose negative point of this software, I think it is very good and meets the demands I have of this software. A software with very interesting features that are ideally suited to management environments. 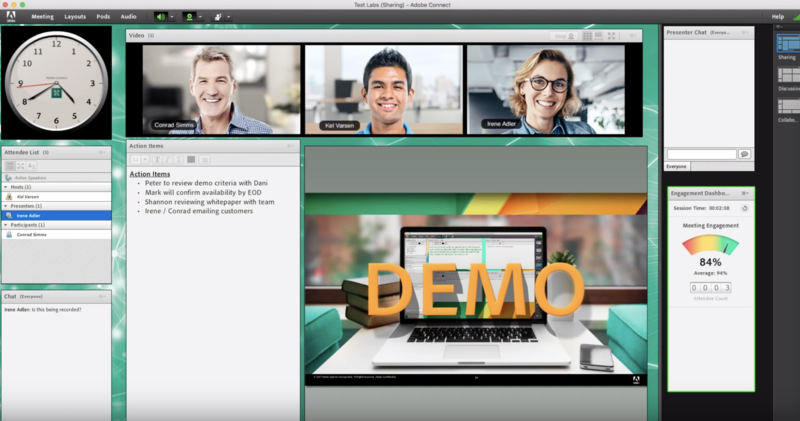 Adobe Connect is a software that I recommend permanently since it has very integral functions to carry out videoconferences. Whenever I use this software I can confirm the quality and security that offers you when making a video conference is also an excellent tool for E-learning. As a Manager, I always look for the best resources and tools so that my performance and that of my workers is always the best. In this quest for excellence, I can assure you that Adobe Connect complements my and my employees' job functions, adding many interesting aspects to our communication channel, allowing us to be always connected and in tune with the demands of our Health Management. I must assume that this software has reaffirmed my abilities as a manager and has made my subordinates better workers. On both presenter and participant end being able to provide learning material to a 'classroom' or session is easy and helpful when you need to go back and see what you provided at a later date. Everyone being able to contribute if setting allow really help with communication and team building. Downside is that everyone needs to download the program before hand to use and it doesn't work all the time on the fly, and needs strong data signal to not freeze up on mobile devices. When setting up the 'conference' it is an easy walk though, first timers will find it easy to learn. Group meetings and classes are spread out across the state or country, having something that connects everyone on multiple device platforms with as many features as Adobe connect has is wonderful! "Very Good for collabration "
There are many features you can't miss while using adobe connect. 1). smooth and multiple design format is really helpful. 2). You can create multiple rooms and redesign them however you want. 3). Live chat and audio/video collaboration is also available for rooms. sometime adobe connect is really slow when there are many members in same room. Sometime while using adobe connect my system hangs and i have restart my computer. Problem occur while sharing large files it get disconnect automatically from rooms. Adobe connect works good with high bandwidth of your internet connection. We connect with our teams every week using adobe connect to share ideas and financial details. It also helps us to connect with my friends with audio/video conference. We have used Adobe Connect for webinar purposes and I love that we can quickly and easily connect with our employees virtually for meetings featuring important content. Not only can we meet live but we can then post the meeting for later watching. I haven't found any functions lacking from the platform. We have used the system a handful of times and have had little to no issues. We are able to gather together large groups of people extending beyond of main campus. Because we can easily gather people in a virtual platform, we've reduced the need to plan and coordinate multiple in person sessions across our campus and instead invite our employees to join us from their own workstations. "easy way to create informations and general presentations online." not much dislikes, though connections challenges happens to affect training and meeting sessions. are you looking for the best platform to conduct meetings with ease, efficiency, effectiveness, accuracy, affordability, and credibility? Adobe Connect is the lasting solution to all you wishes. try it today for the best results. Adobe Connect was the best thing that has ever happened in my business life. scheduling and organizing meetings and trainings is easier than ever, the company's personnel interact more often through video and audio conferencing, this has enhanced cooperation and engagement which as a result has improved decision making. the cost of organizing meetings has declined, reduced manual works during meetings as training and learning are made cloud learning system, document sharing is made easy and accurate, meetings are easily regulated as the admin controls the moderation's, the company reputation has grown up as members can rate the company through survey and polls, increased production as workers are highly motivated.security of privacy as connections or joining s are secured. "Sistema de comunicación web "
Permite enviar privilegios con roles a cada participante, aspecto positivo para que un administrador tome el control de la mesa y adopte las acciones necesarias para la distribución de la conferencia. Permite compartir archivos, aplicaciones, escritorio y calendarizar con outlook. Tiene también posibilidad de grabar las conversaciones para poder enviarlas o guardarlas. Otro punto importante es que se pueden obtener informes con datos y encuestas en tiempo real. La modalidad de pago permite un gran número de conexiones simultáneas. Entre los aspectos a mejorar es que requiere Plugin. En android presenta funciones limitadas, lo cual hace que no se pueda sacar un rendimiento óptimo. El hecho de que un anfitrión tenga que permitir la entrada a un usuario provoca que pueda llegar a ralentizar la entrada cuando hay varios usuarios. La grabación no es automática, lo cual sino guardo en el momento la conversación se pierde. Gran producto para sacar el máximo rendimiento a la información y poder acceder desde diferentes sitios a reuniones o conferencias. Muy bien detallada con una configuración clara totalmente accesible y a un precio adecuado para lo que ofrece. He tenido que utilizar este programa sobre todo en mi últimos proyectos. Destacar la gran integración y accesibilidad que tengo desde cualquier punto. Ya no tengo que desplazarme para estar comunicado en el momento con los demás compañeros de mi departamento. La grabación de las conversaciones es un gran punto a favor para poder verlas cuando dispongo de tiempo y al mismo tiempo tengo la opcion de poder acceder a ellas a través de la nube. "Powerful multifunctional management application for efficient Web conferences"
I like it for being an efficient program with great capacity of solution for web conferences from end to end from any device in a way that increases the productivity and entrepreneurship of the organization. "Adobe Connect un sistema de comunicación web seguro." Adobe Connect es una herramienta de comunicación web genial la cual es muy facil de usar y posee una interfaz facil de navegar, ademas es una potente plataforma multi-dispositivo para gestionar procesos de comunicación y capacitación a usuarios distribuidos en diferentes locaciones geográficas. de igual forma esta gran herramienta comunicacional te permite compartir durante la reuniones en linea: archivos, aplicaciones, pizarra y del escritorio, lo que hace que las reuniones sean mucho mas interactivas y los participantes cuenten con información mas precisa y fácil de comprender. no hay nada que me disguste de esta gran aplicacion, sin duda Adobe Connect apliacion genial y muy facil de usar ademas le ofrece a los usuarios experiencias excepcionales de capacitación, seminarios web y colaboración digital. Le recomiendo encarecidamente esta grandiosa aplicación comunicacional ya que sin duda es es una potente plataforma multi-dispositivo para gestionar procesos de comunicación y capacitación a usuarios distribuidos en diferentes locaciones geográficas. ademas es una aplicación muy fácil de usar y posee una interfaz fácil de navegar, con esta increíble aplicación puedes compartir durante la reuniones en linea: archivos, aplicaciones, pizarra y del escritorio, lo que hace que las reuniones sean mucho mas interactivas y los participantes cuenten con información mas precisa y fácil de comprender. desarrollar instancias de ﻿formación ﻿y colaboración, desde cualquier lugar y a cualquier hora, ademas compartir durante la reuniones en linea: archivos, aplicaciones, pizarra y del escritorio, lo que hace que las reuniones sean mucho mas interactivas y los participantes cuenten con información mas precisa y fácil de comprender. "Software I use every day at work." The software produced by Adobe is the most widely used worldwide. These softwares were designed for the complex labor demands of today, and among these softwares I must mention that one of the ones that I use more in my work is Adobe Connect, a powerful software that allows me to make video calls and videoconferences from the comfort of my computer or cell phone. Among the positive aspects that I can mention of this software we have the option of administrator, which makes that the video calls and videoconferences that I make in my work, have good levels of security, and this is very necessary for me since in these videoconferences we talk about aspects and internal policies of our company, we also establish the work planning with all our personnel. This software also has an excellent clarity in the image and audio of videoconferences and video calls, making not miss any detail of them. Finally, this software adapts very well to my requirements because it gives me security, ease of work and an excellent interface, which makes it very easy to use. A software quite complete and adjusted to the most complex business requirements. Adobe Connect is a very comprehensive software that includes many features that make the communication in your company experience an impressive improvement. I recommend Adobe Connect to all my colleagues as it is the best video calling and videoconferencing software on the market. Thanks to the use of this software in my work dynamics, I have been able to notice how my skills as a worker have improved, taking as a fundamental aspect the improvement of communication with our co-workers through the use of video calls and videoconferences from Adobe Connect. A software that has contributed to my work development. "Perfect software for working remotely with a team"
Ability to share screens as well as use video chat. It's nice to see everyone's face when they are talking, it really makes it a much better experience than a standard "conference call" where it's easy to accidentally talk over others. Nothing. Even without a microphone/camera, those who just want to listen can still tap in and listen to the conversation without having to be "on screen" or speaking. Perfect software for bringing your team together from multiple locations to work on a project, or to share knowledge. Saving recorded files and sharing them with others is simple and easy, the files aren't too large. Ability to work on a large research project as a group even when we aren't even in the same state. We can even record the calls and share them on Box so they can be reviewed later. "Can easily connect to hold meetings and to share all the necessary"
Adobe Connect is very simple to use and easy that it makes our company can easily connect to hold meetings and to share all the necessary information on the screen with whoever it is. "Adobe Connect una potente herramienta para realizar vídeo conferencias y seminarios web"
Adobe Connect es una herramienta altamente flexible, fácil de usar y muy potente, ademas es una solución ideal para realizar de forma rápida y efectiva presentaciones generales, materiales de capacitación en línea, conferencias web, módulos de aprendizaje y seminarios web. Todo esto se puede realizar desde múltiples dispositivos (Mac, Windows, Android Y iOS) con solo conectarse a la red sin importar el lugar donde se encuentren los participantes. Esta increíble herramienta también te permite compartir de manera segura presentaciones y elementos multimedia durante la reunión, de igual forma cuenta con múltiples opciones de chat en tiempo real y ademas el uso compartido de pantalla. Adobe Connect es sin duda una aplicacion altamente poderosa, con la cual podemos realizar vídeo conferencias y seminarios web de manera efectiva y segura. Hasta la fecha mi experiencia con esta aplicación ha sido completamente satisfactoria y ha cumplido muy bien con los requisitos. Les recomiendo abiertamente Adobe Connect es una aplicación poderosa muy fácil de usar y altamente personalizable, ademas es una solución ideal para realizar de forma rápida y efectiva presentaciones generales, materiales de capacitación en línea, conferencias web, módulos de aprendizaje y seminarios web. todo esto sin importar el lugar donde se encuentren los participantes. Realizar de manera fácil rápida presentaciones generales, materiales de capacitación en línea, conferencias web, módulos de aprendizaje y seminarios web, ademas Chat en tiempo real, uso Compartido de pantalla. De igual forma Adobe Connect también te permite grabar y archivar las conferencias o reuniones para su posterior reproducción. Al estar disponible para múltiples plataformas (Mac, Windows, Android Y iOS) te permite realizar reuniones sin importar donde se encuentren los participantes. "There are better and cheaper products out there"
Fairly robust features once you learn how to use them. I particularly like having the ability to edit my recordings. I saw the word "practical" used to describe this product and I'd agree. We have used it at my organization for monthly webinars for the last few years. The user experience does not feel polished or modern, it feels technical. The admin side could be significantly more intuitive. It is a pain (and more $) to have to use another service to integrate the telephone/conference call feature for those without computer audio or on the road. This product will probably do what you need (when combined with a conference call service), but I would look at some other options as well. If you are like me, you will find others more impressive for the same or less money. We are a membership organization, and the ability to offer monthly webinars at a reasonable cost is very important. AdobeConnect, along with a third party conference call service, has allowed us to do this for the last several years. "Communication at a distance, guaranteed!" When I am developing work objectives as an industrial safety supervisor, I am obsessed with the idea that all the software we use to achieve our objectives have the highest levels of quality and operability, without leaving aside the security and confidentiality they have. When we need to communicate in videoconference there is no software more complete and secure to use than Adobe Connect; developed by the company Adobe, is a software that allows you to establish communication in video calls and videoconferences with different members of your team or with other departments of your company. I decided to use this software over other software that offer the same functions because Adobe Connect has an impenetrable security, thanks to the administrator option offered by this software, in which I can manage the videoconference room that I make at work, giving a password to enter the videoconference, which I provide to workers and managers of departments with which I want to communicate. Another aspect that I like very much about this software is that it has a chat that allows us to record data and security reports, it is also very easy to use this chat and is linked to the videoconference room. Another aspect that I highlight a lot of this software, is its beautiful presentation, which makes it very easy to use and fits perfectly with the standards of excellence of the company where I work. Adobe Connect is a software that I have used until the tiredness in my company. One of the most important factors that I am always looking for is that I can fulfill the functions I want, that I have good tools that facilitate my work and that bring to my job performance high levels of security, and this software meets these premises. It is a software that has an excellent quality to present videoconferences and video calls, these can be private thanks to passwords and Administrator mode, an option that I use constantly when I use this software. Taking into account these aspects, I can assure you that this software has no weaknesses and that all its tools and functions satisfy my labor needs. If as a worker you are looking for a corporate software that allows you to communicate with your co-workers, supervisors and managers of your company to discuss strategic issues of the company where you work then I recommend this software, because Adobe Connect has tools that offer quality audio and video of video calls and videoconferencing, security in each of these online rooms, and the option of administrator, which makes you as a professional manage your videoconferencing rooms while maintaining excellent levels of security and confidentiality of the information discussed. A software that you must use if you want to improve your skills as a worker. Each of the tools that Adobe Connect offers me to perform my work as a PCP Safety Supervisor in the company to which I provide my professional services, have strengthened my capabilities, decision making in my job and the direction of my work team to provide safety to workers and protect the strategic electrical equipment of our company. With Adobe Connect I have been able to strengthen my communication channel with other supervisors thanks to all the good functions that this software has and which I use daily. A software that has made me more trained as a safety supervisor in the company where I work. "Quality Video conferencing solution for medium to big sized business"
Dynamic Participation for meetings and conferences, recording options, easy handling of high number of attendees, option of video editing, no time limit for video calling and a free trial period of 30 days with almost all features are some of the aspects of Adobe Connect, which I liked most. For e-learning, it is one of the best solutions as it has various options including interactive polls, comment feature, file sharing and many other attributes including customisable interface. Apart from it, it comes from a reputed and trustworthy brand, Adobe. It is priced for the prime segment and for small teams may not be economical. It requires good data bandwidth for seamless connectivity. A quality solution for conference and meetings from a leader in the software implementation. Please evaluate various options and use the free trial period available with the product. The software will help you feel connected with the team and is quite good for e-learning also. "Great concept, not implemented well"
Adobe Connect is a decent video conferencing platform. I like the presenter views where you can have a host-only set of pods for presenter notes, chat, and engagement dashboard that are private to hosts. I like that the pods can be rearranged and resized and Connect supports different layouts of pods (you can set this up before your conference to save some time with rearranging and resizing). Connect seems like a half-baked product most times. The connectivity bars seem to go up and down at random and are not indicative of your actual internet speeds/connection. The camera and voice pod seems to malfunction at random so participants might randomly drop out of the conference or freeze or become muted - this is not due to internet connection speeds as we have tested this inhouse many times with no resolution. It is not very easy to allow participants to share their screens or use the whiteboard feature. The lag time is often so long it isn't useful - and again, we have tested this with extremely fast internet speeds. No luck! Our organization plans to use another platform in the future, such as Zoom, if that tells you anything! We have many people across the state running a course and with a state as big as Texas, we need to be able to meet virtually once a month. It is nice seeing people's faces and hearing their voices (when it works properly) and we are able to collaborate more effectively than we would over email or phone call. "Reuniones y Coferencias mas efectivas gracias a Adobe Connect." Es una herramienta genial para realizar reuniones en línea, seminarios web y sesiones de capacitación de manera rápida y efectiva sin importar la ubicación geográfica de los participantes. ademas te permite compartir documentos durante la reunión, reproducir archivos de audio y vídeo, encuestas, y también compartir simultáneamente múltiples pantallas. Sin duda estoy altamente impresionado con Adobe Connect y la verdad no tengo muchas críticas al respecto. Solo tendrían que mejorar la visibilidad de los iconos. Pero Una vez que te adaptas a donde están las cosas, los iconos no resultan un problema. Permite un uso estable de la comunicación de audio y visual con grandes grupos. La característica de diseño hace que la transición entre diferentes temas sea más suave. Las aplicaciones descargables permiten el potencial de personalización. La función de grabación y asistencia facilita la difusión de la información. "It is a great tool for video conferencing." 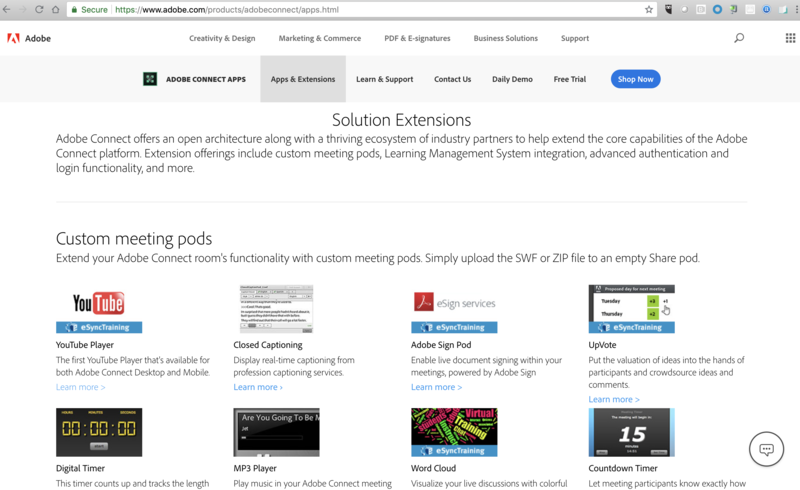 I like Adobe Connect that gives me a solution for the web conferences that take place in the company to hold online meetings, training sessions, among others. It also has a web-based learning solution designed for interactive training. Trainers can train employees directly from their mobile devices. The software is available for a free limited period trial. It has a menu to create meetings and access functions, such as a virtual classroom to carry out the training. I do not dislike anything! Excellent tool! It is recommended to improve its gray and white interface Adobe Connect looks very corporate. Of course, however, it is carefully designed, with a menu at the top of the page that links to the content and saved templates. My work colleagues have benefited enormously with this software since it allows to create a chat in real time and the possibility of using a shared screen during conferences. In this way it allows to have more contact with the clients. "Great for meetings and Training Work From Home Employees"
Adobe Connect can be used to host conference meetings, webinars, virtual classrooms, and on demand training classes. We are using it to train technical support agents who will be working from home and it works quite well for that purpose. We are able to set up polls, Q & A's, and whiteboards which allows us to really get the students involved in the learning experience vs just having them sit and watch us share our screen while teaching material or talking. We are able to let the students have drawing or writing privileges which gives us the ability to have them present or demonstrate what they have learned to the rest of the class. We are able to share documents, URLs, and content and have them be persistent throughout the entire 4 weeks of the class. In fact it allows us to have a virtual content library available to the students from start to the finish of the course. The students are able to take notes within it and have them saved and accessible whenever they need to refer back to them. We are able to have multiple presenters/ hosts within the same meeting or class as well as set up breakout rooms for splitting the class into smaller groups to work on special projects. There is a backstage area so that we can have materials that we will need later in the meeting within easy reach. It allows for course and curricula creation, and management along with learner tracking and certification. With so may options available to us the interface can easily get a bit crowded or messy looking at times but that is manageable by paring down the number of options you use at the same time. It keeps us from having to train work from home employees in house which drastically decreases the cost of training as well as the amount of time it takes to get the employees trained and in production. "making meetings meet its goal." not much dislikes, though several text pop-ups sometimes are tiresome as presenters find it difficult to read and respond. Adobe Connect is a God-sent platform that exposes businesses to proper planning and make meetings to be efficient and effective. try it for amazing results. Adobe Connect has enabled our business enhance market engagements through improved advertising, improved flow of information and skills through efficient trainings, improved participation due to modern design and graphics for instance, member of meeting can send or keep a copy of the chat. "A very professional and corporate videoconferencing room." Who has not needed to hold meetings with their bosses or co-workers and has not been able to do so because they are traveling on business? With this software you can solve these problems because Adobe Connect is a powerful and diversified software that offers you videoconferencing rooms while maintaining the highest standards of professionalism, security and perfection in their tools. We use this software a lot in our foundation because most of the time we have to cover activities and meetings outside our headquarters, so most of our colleagues are not in the place where we do the meetings. This software offers us not only high performance videoconferencing rooms but also allows us to share reports of developed activities, research works and written observations, very important to apply the necessary correctives in our work dynamics in the Foundation. It also has one of the most complete tools in the Videoconferencing Rooms that is the option of the administrator, which allows you to create a private room where only the administrator defines who can enter or not through invitations, this makes our meetings very secure through videoconferencing. When videoconferencing has many participants the software tends to have conflicts in its functions slowing down, this greatly affects the development of videoconferencing and the transfer of information with this software. Software recommended to all corporations that require communication software to make important meetings with workers and bosses. I always recommend this software because many of our bosses have to travel to many places and to communicate with the work team, just informs us that it needs our attention and invites us to a videoconference where we are the members of the team receiving their instructions. A very useful software for the fulfillment of my work. This software has played a fundamental part in perfecting our use of state-of-the-art technological tools such as videoconferencing. In an effort to improve our skills in handling this software, we have increased our performance and speed of delivery of reports and analysis of activities requested by our supervisors, since Adobe Connect allows us to shorten the distances between the different members of our office, without requiring all workers to be in the same place. This software has only benefited our foundation. "Adobe Connect adds professionalism to your work"
In general, my clients belong to large companies and corporations, where the labor requirement is a fundamental requirement to obtain excellence in the results presented. When my clients require my services in administrative and political matters, they prefer to use this software to communicate with me. Adobe Connect is a very complete and competitive software, which has excellent functions when videoconferencing with my clients. I usually have leadership skills in business meetings, and Adobe Connect gives me the ability to take on these leadership roles because I can fully manage the videoconference, giving each participant a role and thus best manage the work issues that are incumbent on us at that time. In addition to the above, another advantage of this software is that videoconferences and webinars can be public and private, and I can give security to each videoconference through a password which must be written to enter the videoconference room where we are working. Many of my clients use this software from their android cell phones, iphone or tablets, and I have noticed that the application of this software does not have the same amount of functions as its version for pc. This slows down my dynamics in videoconferencing rooms, making the final product of my work is conditioned by the loss of time. It is undeniable that today, the demands on the job are greater than in previous years. It is not enough that you are an expert in your field of studies but you have to manage multiple software and tools to increase the quality of your work products. Adobe Connect is that tool that I recommend to all professionals to achieve these goals. Learning to use it will allow you to project much more your professional career and, therefore, be a better worker. Since I started using this software I have been able to learn a lot about how to work in videoconferencing rooms with different types of clients, from the most demanding to the simplest. This software has made me grow as a worker because it has allowed me to perform much better with my clients who, due to their reduced time, do not have the possibility to meet with me. I am very grateful to the Adobe Connect developers for creating this software. "Reliable, safe and very good for tutorials and webinars "
In my job it is very important to have software for videoconferences, tutorials and webinars. Our professionals in chemistry carry out seminars, recommendations and theoretical incorporations of great importance for the fulfillment of our labor goals, for that reason we use Adobe Connect, a quite complete software made by the Adobe Company thinking about the great professional demands of our time. You can make public and private videoconferencing rooms, allows sharing files of all kinds and synchronizes with other software to use them as tools in videoconferencing, you can also get survey results using this software in real time by measuring the performance of the software and their contributions. For android systems this software has many limitations to use it to its full capacity. I have always had certain criticisms with those softwares that don't work very well in the computer, but in other operating systems like android they don't have the same functions, this limits their use a lot and it seems to me that they shouldn't do this. A software with many special features, quite complete and suitable for large work and educational environments. I recommend this software because by using it you can connect with many professionals in your area of work who have information and work methodologies that can help you be a better worker. How qualified and professional this software has made me. Using it at work has allowed me to connect with many people, I can train in many webinars and tutorials, and therefore our work has more content and quality. This software has been my open window to professional success. "Function and Form with a Learning Curve"
All of my Adobe presentations look extremely professional and well put together, and I don't want to take any credit for that. With multiple designs for formatting and some smooth transitions already built in, switching from one preset view to another looks sharp and professional. It's very possible this is just our organization, but the lag during conversations using VoIP technology made it challenging to have in depth conversations. Sometimes the lag could get as bad as 4-5 seconds. There were many occasions where if the material being discussed was significant enough to need everyone hearing clearly and at the same time, we would just use Adobe for presentations and video, and a separate conference line for voice. Figure out if you're looking for a conferencing tool or a training tool. If the primary purpose is going to be for web meetings, then I would likely look elsewhere. If you're trying to upgrade your training platform, this is a great option. They offer an abundance of tools that make this a viable option for those who will be presenting without producers as well. Adobe has allowed us to keep our training headcount limited while still providing training to individuals around the country. Adobe allows a team of 8 to support 200+ individuals on each new hire week, in 50+ offices is 36 states. Adobe being used for training has also allowed us to refocus some other individual away from training and in to other projects because of the reach the program now allows us to have. The ability to conduct live polls during a meeting or a webinar is a good feature. If you are interested in an enterprise solution for webinars to support a large client base, this is a good tool. Also, if you are looking at including close captioning, Adobe Connect might be the only option out there that supports this feature. When using it for very large meetings, this tool is definitely beneficial. I've used it in the past to conduct national webinars. "Adobe Connect- Great for few, Slow for All"
I like Adobe Connect because it allows many methods of interaction for our staff to engage such as polls, breakout rooms, etc. It also has a live chat box and can use video or phone conferencing as well. I dislike how slow Adobe Connect gets when there are more than ten people in a group. It also sometimes does not sync with all formats for presentation. think about how many people will be using this product! We are solving the problem of being a virtual environment by using adobe connect to hold our conferences when we can't be in person. "The Gold Standard of true virtual meetings!" So many things to like. 1. Persistent rooms - build your layout and add your content ONCE, and it will always be there, ready for your next virtual meeting without you having to rebuild and reload every time. If you are doing several meetings or training events with the same material - this is a must and Adobe Connect does it. 2. Multiple hosts and presenters - no passing the ball - just make another person a host at the same time as you and now you can collaborate and work together to deliver your meeting or training. 3. MANY great pods - polls, quizzes, chat, whiteboards, file shares - and many add ons to make it even better. 4. TRUE breakout rooms that you can customize, and really drive collaboration and engagement. 5. Sharing results from breakout rooms - whatever they artoe down, recorded or created in the breakout rooms can easily be shred with the rest of the groups. 6. engagement meters - who is not really engaged or paying attention? Adobe Connect can help you figure that out. As good as it is, there are some caveats. 1. It has a bit of a learning curve - so many features, so many things to remember and learn. 2. Bandwidth is always a challenge - participants need to make sure all other programs and browser windows are closed or you get lag. 3. System can just shut down or freeze for no reason (that can be found easily) and that requires restarting a meeting which is never a proud moment in delivery. 4. Adobe still hasn't made it work all the time with macs - they really need to put some people on that and FIX IT! 5. My opinion - if you are going to use Adobe Connect for serious training - you need a producer on with the facilitator for EVERY session. Not a bad thing just an important thing to consider. And since you CAN have both roles with full admin access it is actually a plus if done right. Get a trial account and learn how to use it - compare it to what you are currently using AND know exactly what you want and see if it fits those needs. Be aware that this is a robust system that takes practice to use AND seriously consider hiring an experienced producer to help you maximize its features and execute good meetings and training events. Converting live - face-to-face training in virtual training with the same level of interaction and engagement while lower overall training and associated travel costs. "possibility of recording the sessions"
I like that the rooms can be private or public with access to guests or registered users in the case of those registered, there is a registration and access by username and password and in the case of guests wait for the hosts to authorize them. On ipad and iPhone, you need to install a specific application. And the fact that the host must accept the entry of an unregistered guest can slow down the entry when there are many people. I recommend that they use it since several presenters can carry out the preparation of content, private chats, blackboards and personalization of the design in the background, all during the course of the meeting. It is very useful to me the exclusive presenter Area, Which can only see hots and presenters to prepare the content. 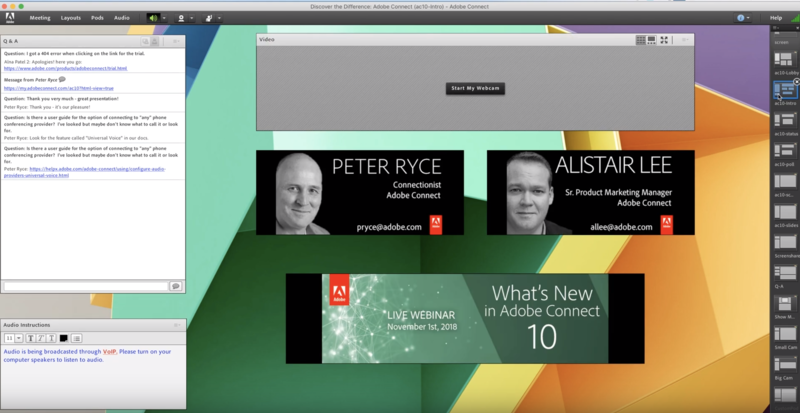 The ease of connecting with clients to host webinars has been a breeze with Adobe Connect. Also the ability to record your sessions has been very helpful. Also the ability to have live questions during the webinar is helpful. Having to explain how to download the software before hand or any updates you need to have installed for it to work properly. The process is a little long for logging in, but that's okay for a webinar, for a video conference we would be less likely to use adobe connect. Our company has a tool that people use and it has solved the problem of showing groups of people how to use it remotely. We realized after years of using it that we can record webinars and mail out to those who haven't been able to join scheduled webinars. "Robust program for our webinars"
Creating events in Adobe Connect is very easy, and I like that they can be duplicated so that I don't have to build out things like registration questions every time. I wish that the web room would open for participants 15 minutes prior to the start time of the event. Our attendees like to get into the web room early, but I have to set the "start" time of the event 15 minutes early in order for them to do so. We recently transitioned to using Adobe Connect for webinar registration, in addition to continuing its use as our webinar host platform. Streamlined processes make it much more efficient to host webinars. "Easy to use with great features but not always stable"
I like the ability to video conference without specialist hardware. The ability to mute mic/freeze cam are helpful to preserve bandwidth. The overall layout of the GUI is pleasing. At times the system freezes and you are required to log back in to a meeting. Ther issues are not necessarily with the interface but with the backend system and available bandwidth. It is sometimes difficult to share large files and I have failed to share Powerpoint with Video embedded in it. The system is great when you have good bandwidth and need simple video conferencing/webinar software. The need to meet with colleagues in different locations/countries. The ability to share ideas and materials online in real time. "Easy and fast access with adobe. " I like it beacuse it is a video-conference system through synchronous virtual classrooms which incorporates and LMS that synchronizes with the web conferencing application and content creation tool that synchronizes in turn with the classroom and the LMS. I don´t like it beacuse requires a payment account for many of the most required features. I recommend it because it allows organizations to give a more attractive experience for the web conferencing, rapid training, sales and marketing that can be implemented behind a firewall to ensure control and flexibility. My favorite feature of AdobeConnect is that you can set your own URL for the class or have random ones made for you. I also like the ease of configuring the rooms, it's very intuitive and is accomplished quickly. The audio is kind of clunky sometimes and hard for participants to figure out. Also the roles aren't described so the RBAC is a bit hard to administrate. Get a demo of the product before you commit to ensure that the product will meet your needs. Some of the licenses can get quite pricey so make sure you know what you're getting first. We offer online training classes and we were looking for a product that would facilitate that. AdobeConnect did the best job for the best price. 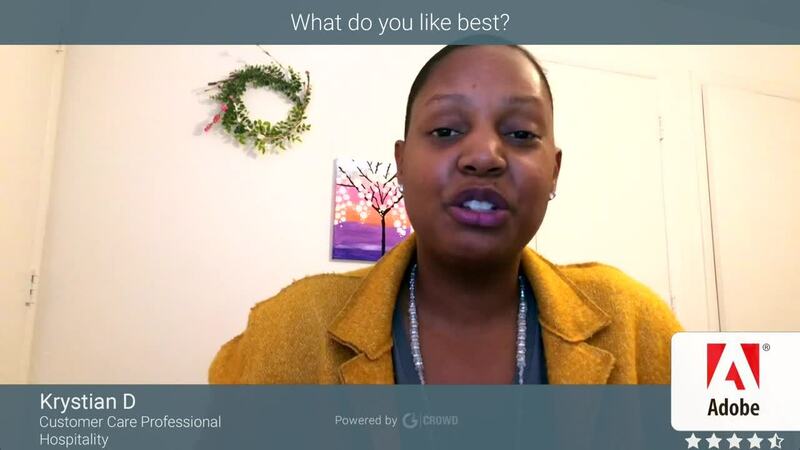 "Adobe Connect is a phenomenal tool for virtual agent training"
The ability to assign presenters and share screens, audio and video options, and push links directly to groups are just a few of my favorite features. t's ease of use and functionality keep the program fresh and convenient. There are occasional places that kind of go against logic. For example; clicking send on a poll actually deletes it all together. But these are so limited and few to learn, they have a relatively low impact. 11 weeks of virtual training with regionally disperse travel agents; it really helps to make sure everyone is in the same place at the same time, and keeps covered information well organized. "Adobe Connect gran herramienta para juntas y seminarios"
Adobe Connect es una muy buena herramienta a la hora de interactuar en tiempo real, ya sea para dictar charlas,conferencias, juntas de negocios entre otras, es de fácil uso para los presentadores y es personalizable. En algunas ocasiones en las charlas se escucha eco y no disponen de una versión para dispositivos móviles, esto seria genial, cuando hay un numero significativo de participantes en el grupo hay retraso en las voces. Con esta herramienta resolví el traslado y viáticos del personal y el gasto de recurso para ambientar espacios con el fin de dictar conferencias o realizar reuniones de negocios.